Tablespoon white sugar, (optional) Easy! Prepare the shortcrust pastry (or buy it ready made), and divide it approx. 60/40. Roll out the larger piece and place on a round baking tin. Mix the currants (or raisins) and mint together in a food blender; add two tablespoons of water to blend it to a soft mash. Add sugar if you have a sweet tooth, but the currants provide natural sweetness. Roll out the second half of the pastry and place across the top of the other, sealing in the currant mixture. Trim off excess pastry. Glaze the pastry with beaten egg, or with cream, milk or yoghurt. 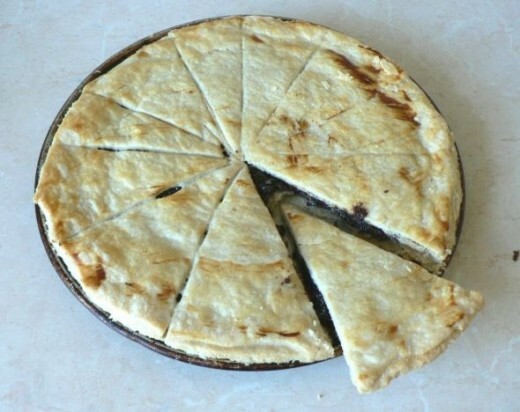 Make a small hole in the pastry to let out steam. Bake in a moderately hot oven (around 190C or 375F) until the pastry is obviously cooked and golden.